The top three teams pose for a group photo at the conclusion of the ladyboy water-volleyball championship, held at Areca Lodge in Pattaya. November 11. More than 5 million baht has now been raised from the annual ladyboy water-volleyball championship, a peak reached at the sixth competition held in Pattaya on November 11. Five teams from Pattaya, Chonburi and Bangkok clashed in the pool at the Areca Lodge on Soi Diana, raising 780,000 baht this year to reach the cumulative goal. Rotarians and organizers Tony Sales, Jan Abbink and Carl R. Dyson from the RCES were on site for the occasion to ensure activities went as planned. The pool area was a hive of activity and bustling with spectators, cheerleaders and team members. Tickets costing 1,500, which included the gala dinner, were sold out long before the day of the tournament and over 200 guests turned up to witness the action and support the teams. Joy (left) and Carl (right) from the RCES represented the Pakse Medical Centre in receiving a check for 200,000 baht. Organized and managed since the beginning by volunteers, including the Rotary Club Eastern Seaboard, only direct, unavoidable costs are deducted from ticket sales, such as hotel, prize money, printing and promotion. All proceeds will go to support three different organizations this year, including the Pattaya Orphanage, the Glory Hut Foundation and the Pakse Medical Centre. 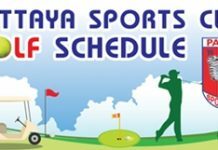 Now one of Thailand’s most unusual social, sporting and charitable events, the tournament attracts a diverse and enthusiastic international audience. The competition was first introduced in 2012 as a day of ‘fun in the sun’ and to give the transgender community a positive showcase event. Activities kicked off from lunchtime with the five teams, White Sharks from New Bar, the Golden Eagles from Why Not, the Green Hornet from Katoeys are Us, the Pink Panthers and the Black Scorpions from Lita Bar all battling for the title. Players were dressed in team coloured bikinis for both the water-volleyball tournament itself and the cheerleading. Each match was 15 minutes long with a 15 minute interval, with the two teams accumulating the most points moving on to the final. Tony Sales, director and project manager – LBWVB joins the Green Hornet team members for a photo. The teams were very closely matched in terms of points, but the main objective was to have fun and entertain the crowd. Rain beginning mid-afternoon failed to dampen the spirits of players or spectators and it was great fun and a blast was had by all. The winners this year were the Pink Panthers, a team of independents from the Chonburi area and unaffiliated with any sponsor. They played a flawless match in the final to outlast the Golden Eagles from Why Not Bar in Bangkok. It proved to be a remarkable turnaround for the Panthers who in previous years had always placed last. Third place went to the Green Hornets from Katoeys are Us, fourth to the White Sharks from New Bar, and fifth to the Black Scorpions from Lita Bar, the last three all from Pattaya. The best cheerleading team represented Katoeys are Us. Golden Eagles take on the Green Hornets in the Areca Lodge pool. 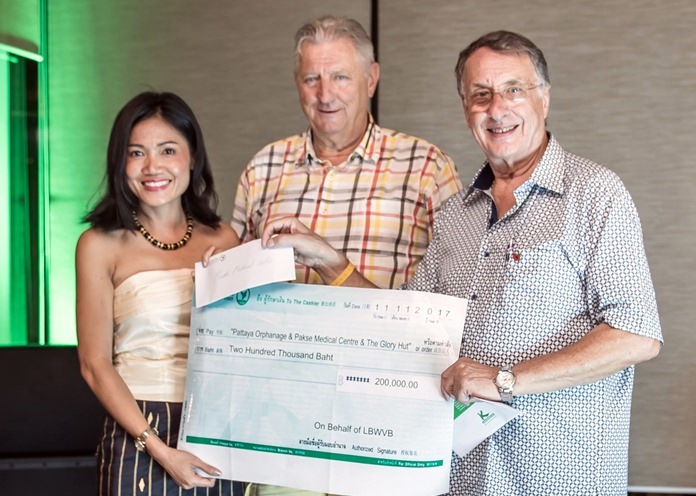 The three benefiting charities this year all received staggering 200,000 baht checks at the evening banquet. The Glory Hut Foundation, based in Pattaya, provides housing for displaced HIV individuals while the Pakse Medical Centre on the Thai-Lao border is in need of urgent support. Entertainment during the evening gala was provided by guest singers, followed by a special performance from the children of the Pattaya Orphanage. The Pink Panthers were the overall winners of this year’s tournament. After putting on a special performance, the children from the Pattaya Orphanage were presented with a 200,000 baht check which will go towards their education, daily expenses and more. The Glory Hut representatives received 200,000 baht to support their facilities and running costs.